Q-Mobile introduces once more mobile tablet hand-set for its valued customers of the World with the name of QMOBILE QTAB V7. 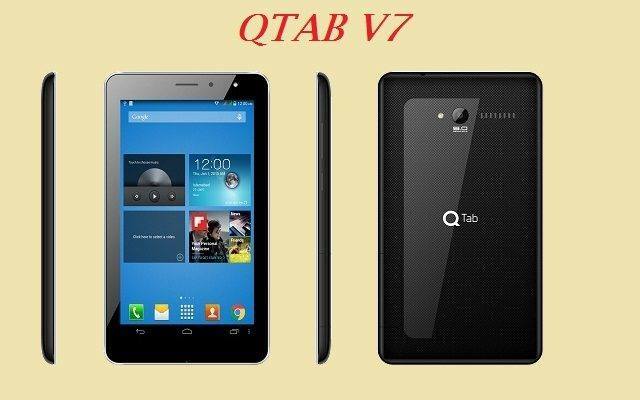 In the past it has also launched QMOBILE QTAB V3 and now it has launched QTAB V7 with more latest incentives. This is a perfect product for all the tablets users because it is giving countless latest technologies and along with astonishing features. QMobile designs this hand-set with amazing looking and body structure and it has given shining body look of this product. Android Lollipop system is included in this tablet and all the Android users can easily use this product without facing any problem. Q-Mobile is attached speedy Quad-Core processor system of 1.3 GHz in this product and it is also giving 1 GB RAM feature for using. Users don’t face any kind of lacking and hanging issue while operating this tablet. This is master piece tablet of QMobile and it is claiming this hand-set will be accomplished for attracting more buyers from all over the World. Camera facility is also very amazing in this product and users can take countless selfies by using its 2.0 mega pixels selfie flash camera. It is also providing 5.0 mega pixels rear camera option in this hand-set for using. 3G internet options is available in this tablet with network HSPA and users can avail speedy 3G internet service after buying this product. The further details of this latest QTAB are mentioned as below. Processor: Quad-Core 1.3 GHz Processor. Memory: External SD Memory up to 32 GB. Rear Camera: 5.0 Mega Pixels (LED-Flash). Front Camera: 2.0 Mega Pixels (Selfie-Flash). Display Screen Size: 7.0 inches. Display Colors: 16M Colors and WSVGA capacitive touchscreen. Bluetooth, GPRS, WLAN, EDGE, Wi-Fi 802.11 and WI-FI Hotspot. 3G Enabled: GSM / HSPA. Audio: FM-Radio, 3.5 mm audio jack, MP3, MP4 and WAV. Messages: SMS, MMS, E-mail and IM. Ringtones: MP3, Downloadable, Polyphonic tones, Sound-recording and WAV files. Other Features: Multi-touch display option, GPS Support, A-GPS Support, Speakerphone, Calendar and Google Search. Latest Features: QWERTY keyword, OTG supported G-sensor, Long-Lasting Battery Feature and Crystal Display Screen.